Fire Protection Association (2012): 'Arson has become the single most frequent cause of fire in buildings of all kinds, resulting in loss of life and injuries, enormous financial losses, business interruption, damage to the environment and loss of heritage buildings. Each year more than 60 people die and 2000 are injured in fires that are deliberately lit, while the annual cost of arson in England and Wales is estimated at £1.3 billion. The final exits on an escape route in a public building are known as fire exits. The final exit is secured by the final exit door, which must allow unobstructed authorized passages and provide climate control and safety to the building and the people. Under Article 14 of the Regulatory Reform (Fire Safety) Order 2005 (RRO) it is mandatory that the entire escape route up to and including the final exit from a building must remain unobstructed at all times. This is also the requirement of the Building Regulations. If the final exit door carries an unprotected letter plate, it is not fit for purpose because there is a possibility that fire and smoke or other harmful substances can spread into the building through the letter plate. The unprotected letter plate can undermine or completely cut off the main escape route. This can happen when the flap of the letter plate is open or partly open, like when it is jammed by the mail items or a rolled-up newspaper. Also, the flap may fail to close correctly due to malfunctions. Furthermore, the flap can be open with a variety of malicious intents, like for access to locks or letterbox arson where the fire is introduced through the letter plate deliberately. For allowing 24 hours random mail deliveries the building managers and residents cannot control the letter plate flap to be closed at all times as it is expected from them in the case of the fire doors. For example, the entrance/exit doors of flats that are facing the common areas (like in blocks of flats and houses in multiple occupation), must be fire doors. This is essential for the 'compartmentation of flats' - limiting the spread of fire and smoke in case of a fire that may originate in the flats or in the common areas. While fitting a 'fire rated' letter plates to entrance/exit doors to flats is currently allowed in the UK, these doors are not safe and not fit for purpose. Whereas the fire resisting entrance/exit door to the flat is expected to be closed and even locked, the flap of the 'fire rated' letter plate can be open or partly open for a number of reasons no different to the flap of an ordinary letter plate. Any fire safety professional will tell that most fire deaths are not caused by burns, but by smoke inhalation. Cold smoke through the open or partly open letter plate, which contains odourless and tasteless carbon monoxide gas CO, would be the primary killer at the early stages of fire before the intumescent lining, which should be activated by the high temperature, can go into action. When the smoke becomes hot the expansion of the intumescent lining will be obstructed by the items, which can be stuck inside the letter plate. This will undermine the 'fire rated' letter plate protection against the hot smoke too. It is odd that a fire door with a 'fire rated' letter plate is not tested when the flap is open, although it is known that on site the position of the flap is unpredictable. The fire rated doors and doorsets are tested to meet the UK Standard BS 476:1987 Pt. 20/22 and Pt. 31.1 or BS EN 1634-1:2004 (1634-2 or 1634-3) with the flap of the 'fire rated' letter plate in closed position. One of these tests pass is all that is required by the official guidance to get the fire door to the market. Clearly, the tests are not realistic compared to a real world environment. These products are useless if we want to protect a property and the residents who are behind the door. For that reason, one cannot simply rely on the 'fire rated' letter plates to make fire doors fit for purpose as the final exit doors. They cannot always protect against spread of fire and smoke and never protect against letter box arson. The letter plates are the usual targets for vandalism and arson. When such inadequate security is confronted with a criminal it is totally unfit for purpose and worthless. Like the ticking bomb they can create a serious problem in any property. This is unheard of in any other country. It continues to be a problem impacting consumers and businesses alike. 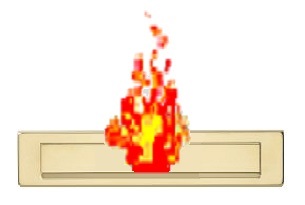 The fire door with the unprotected fire rated letter plate has no fire, arson, intruder, crime or vandalism resistance and would instantly fail the fire and smoke resistance test. It is important to recognize the possible route for smoke and fire leakage through the letter plate. For the final exit door to be fit for purpose measures must be taken to ensure that the letter plate is protected. Fire doors tests must reflect real life. PowerPrize Limited was the first one to raise this issue and campaigned for many years to deliver the message. Hopefully, in the aftermath of the Grenfell tragedy, more attention will be given to fire safety and the situation will change. For owners/managers of the premises, which are covered by the mandatory legislation, protecting the letter plate for preventing arson is a legal requirement. This is covered for Fire Risk Assessment purposes by BAFE Scheme: SP205 Version 2: December 2012 and a number of Guidance documents, including ASFP Guide to Inspecting Passive Fire Protection for Fire Risk Assessors (paragraph 3.3) and in the Guidance document on fire safety for blocks of flats (paragraph 43.2). In case of an accident owners/managers are risking hefty fines or even imprisonment. The insurance company can refuse the payout if it turns out that the mandatory legislation requirement was not met. Fitting IdealGuard™ secure by design multifunctional eco letter/mail box will ensure the letter plate superb security against all nomenclature of potential threats without disruption to mail deliveries. The product is superior to any other letter box and ideal for the landlords and housing providers, owners/managers and occupants of commercial and domestic properties. It appeals to insurers and offers real peace of mind to everyone concerned. Making the property more secure and the insurance claims less likely IdealGuard™ products may reduce insurance losses for the insurance companies, the property owners and occupants.